These easy, spooky Halloween Brownies are the perfect fun and easy Halloween treat for a party! 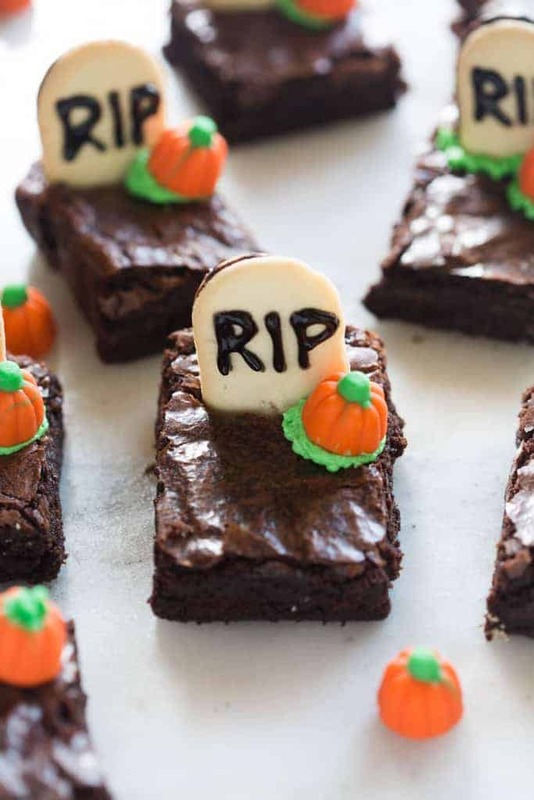 These Halloween Graveyard Brownies are as cute and as EASY as it gets! They’re proof that you don’t need to be a professional baker or have any special equipment to make a super cool, creepy Halloween treat. I like a Halloween treat that tastes as good as it looks, but that doesn’t have me spending hours in the kitchen. You know what I mean? My Chocolate Chip Spider Cookies fall under this same category. All you need is the ingredients for chocolate chip cookies. That’s it! My kids really love both of these fun Halloween treats, and they always get plenty of positive attention at Halloween parties. For the brownies, you can make the batter from scratch, or you can use a box mix (the ghirardelli brand is pretty good quality). I use this chocolate brownie recipe, but I cut the ingredients in half, to bake it in an 8×8” pan. I like to bake the brownies in a pan that has been lined with parchment paper. That way, you can pull the brownies out of the pan after they’ve baked and they are much easier to cut and look better. Use the black gel pen to write the words R-I-P at the top of each Milano cookie. (You should be able to find the gel pens from your local grocery store, in the baking aisle). Use a slow, steady hand. You could even practice on a leftover piece of parchment paper if you want. Then press the cookie into the brownie, near the top edge. 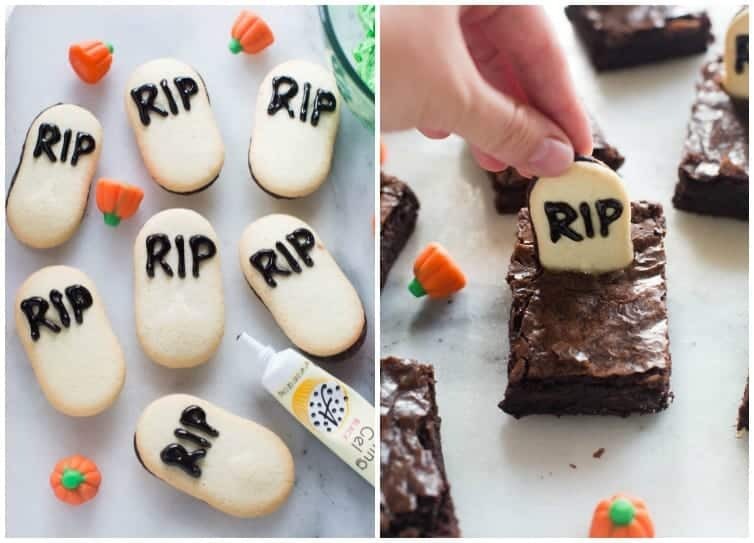 You could cut 1/2” off the bottom of the cookies, before pressing them into the brownies, if you don’t want the “headstones” to stick up as tall. Spoon a little green frosting onto the bottoms of the candy pumpkins and add them near the cookie headstone. 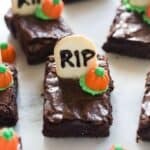 Halloween graveyard brownies are the perfect fun and easy Halloween treat for a party! Line an 8'' baking pan with parchment paper, leaving a little bit of overhang on the sides so that you'll be able to easily pull the brownies out of the pan. Pour brownie batter into the prepared pan and smooth it into an even layer. Bake according to recipe instructions. Allow brownies to cool completely. Pull up on the parchment paper and transfer the brownies to a flat surface. 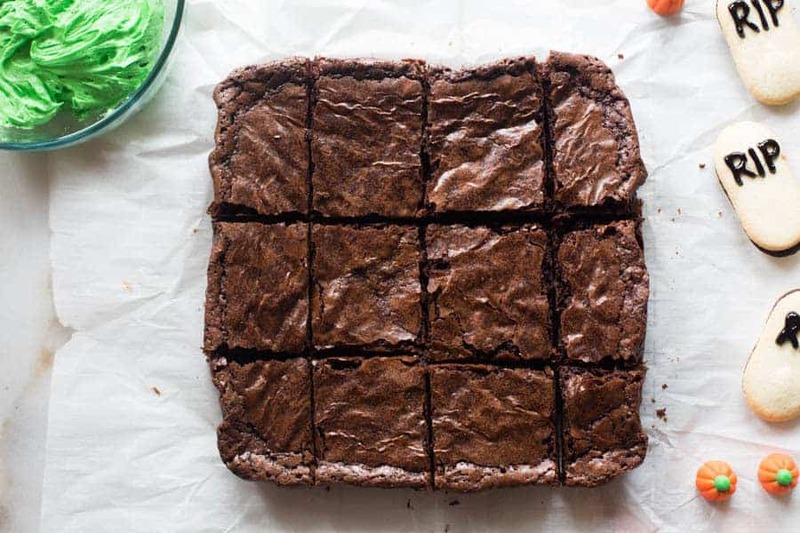 Cut the brownies into rectangles. (I cut mine 4 x 3 to make 12 rectangle brownies). Mix in a few drops of green food coloring. Set aside. Use the black (edible) gel pen to write the letter R-I-P on the top of each milano cookie. I also cut the very bottom edge off of my cookies to make the "headstones" a little shorter, but you don't have to. 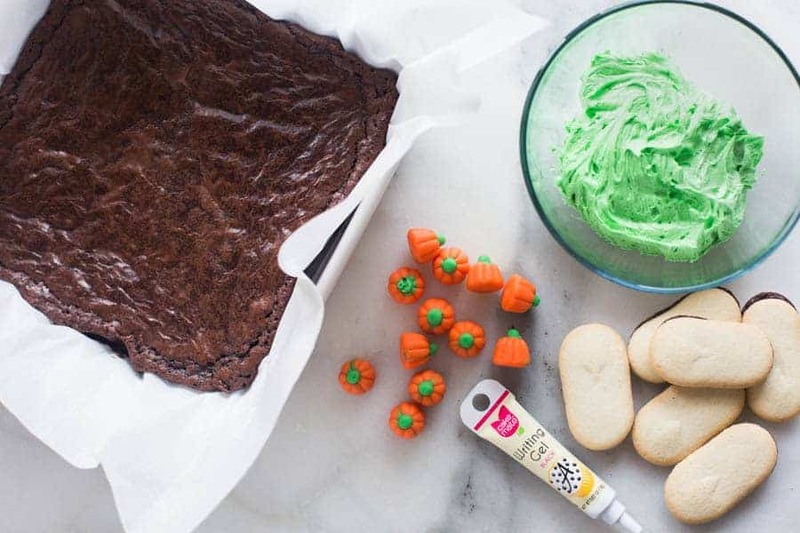 Spoon a a little green frosting onto the bottoms of the candy pumpkins and add them near the cookie. *You can make the brownies from scratch, or use a box mix. This recipe is for an 8x8'' pan of brownies. I use this chocolate brownie recipe, but I cut the ingredients in half, to bake it in an 8x8'' pan. Or, you can make a 9x13'' pan, and double the amount of cookies, candy pumpkins, and frosting used in this recipe. If using a box mix, I would suggest Ghirardelli brand of brownie mix. They're made for an 8x8'' pan, and the quality is better than most. *Black decorating gel should be easily found in the baking aisle (near the birthday candles etc.) at your local grocery store, or at Walmart. These treats were a big hit! Everyone loved them. Especially enjoyed the 3 varieties of candy, Milano cookie and brownies. Is there any special reason to not use the frosting recipe when making these? Tjanks! I meant frosting the entire top of the brownie.with chocolate frosting. Which I believe I saw in your brownie recipe. You could definitely frost the entire brownie–yum! Thanks! I ran out of time to make them, but I might make them and take them to my aerobics class to give away Saturday because I have all the supplies! I’m an Activity Director in a Rehab hospital. I made these for my patients and everyone loved them!!! People took pictures so they could make them with their children. That’s amazing, and makes me so happy! Thanks for sharing 🙂 I’m so glad everyone loved them–and what a sweet thing for you to do.